Background: Metformin is very important anti-hyperglycemic drug for non-insulin reliant diabetes mellitus. It excretes through urine. Therefore, its analysis is an important issue; especially with versatile capillary electrophoresis method. Introduction: Inexpensive solid phase micro membrane tip extraction (SPMMTE) and capillary electrophoretic (CE) methods were presented for monitoring of metformin in urine sample. 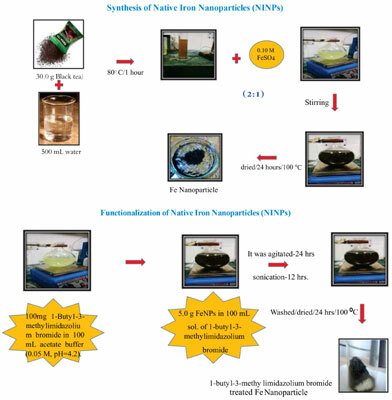 Method: Iron nano composite adsorbent was prepared by green chemistry for SPMMTE. CE experimental conditions were fused silica capillary (60 cm x 50 µm I.D. ), phosphate buffer (50 mM, 3.0 pH) as back ground electrolyte (BGE), 20 kV applied voltage, 254 nm detection, 20 seconds injection time and 27±1 ºC working temperature. Results: The values of electrophoretic mobility, electroosmotic mobility, migration time, number of theoretical plates and velocity were 2.71 x 10-2 cm2V-1s-1, 3.50 x 10-4 cm2V-1s-1, 10.05 minutes, 14,400 and 5.42 cm min-1, correspondingly. The % recoveries of metformin in the laboratory prepared solution in water and urine samples were 90 and 80%. Conclusion: It was observed that the developed SPMMTE and CE methods may be used to analyse metformin in any urine sample. Keywords: Fe nano composite adsorbent, solid phase membrane tip extraction, capillary electrophoresis, metformin, urine sample, analysis. Keywords:Fe nano composite adsorbent, solid phase membrane tip extraction, capillary electrophoresis, metformin, urine sample, analysis. Abstract:Background: Metformin is very important anti-hyperglycemic drug for non-insulin reliant diabetes mellitus. It excretes through urine. Therefore, its analysis is an important issue; especially with versatile capillary electrophoresis method.